Double the fidelity of your phone calls with HD Voice. Get color picture caller-ID and sync online contacts and pictures with Facebook, others. Get an Instant Second Line and make or take a second call even when the Telo is in use (Premier customers only). Cost of taxes, fees and hardware are not included in the calculation. Ooma owners are Ooma believers. 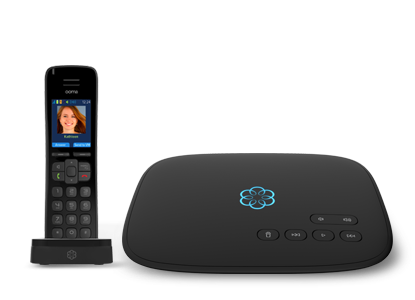 Ooma uses an advanced voice compression algorithm that reduces bandwidth consumption by 60% over standard VoIP technology. Ooma prioritizes voice packets without slowing down the rest of your network so you can enjoy crystal-clear calls even while uploading video clips. Ooma takes your privacy seriously. We use the same encryption technology governments use to protect classified data (which makes Ooma even safer than your old landline). Packet loss causes phone calls to sound stuttered or garbled with standard VoIP technology. Ooma detects packet loss before you even hear it and automatically deploy redundant packets to boost the clarity of your phone call. Ooma HD Voice technology doubles the fidelity of your phone calls. When you and the other caller use an Ooma handset, or any HD compatible phone, your voice will sound more natural than ever. With Ooma, you can keep in touch with your friends and family virtually anywhere in the world–for next to nothing. International calling is purchased from your My Ooma account. All you need is an Ooma device and an active account. To purchase log in to your My Ooma account, choose your plan, and add to cart. Low everyday rates for international calling. No commitment required. Unlimited minutes to 61 countries. Calls over plan minutes, and calls to destinations not covered by the plan, are billed at Ooma's standard low rates. The rates displayed do not include a mandated Federal Universal Service Fund (FUSF) fee and FCC regulatory fee that changes quarterly and usually ranges from 15 to 18%. The regular connection fee of 3.9¢ is waved for subscribers of any of our Internations Plans. Can I call anywhere in Canadathe U.S.? Ooma allows you to make local and long-distance calls across Canadathe U.S.. Calls to 900 numbers, phone chat services, traffic pumping services, Puerto Rico and other U.S. territories are excluded. Ooma comes with with all the features you've come to expect, like caller-ID, call-waiting, and voicemail. You'll also get a 60-day free trial of Ooma Premier. 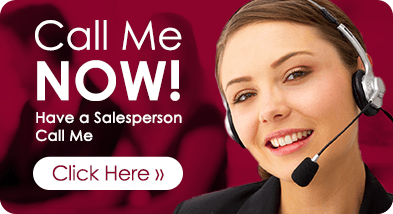 This package of over 25 advanced calling features includes Blacklists to stop pesky telemarketers, Multi-Ring to stay connected on the go, Call Screening so you can listen in before you pick up the phone, and much more. If you like Ooma Premier, you may continue your subscription after the trial-period for just CDN $9.99 per month. All you need is a high-speed Internet connection (cable, DSL, satellite or fiber-optic) and a regular home phone. 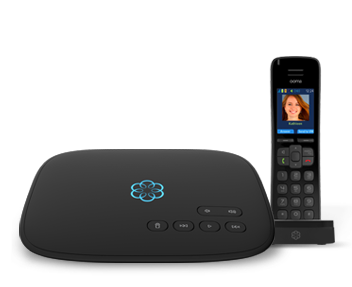 Ooma works with your existing corded or cordless home phones. Use your phone exactly like before - only now you don't have to worry about outrageous phone bills! The cutting-edge Ooma PureVoice™ HD technology delivers the clearest, most reliable calls over the Internet. PureVoice HD leverages sophisticated algorithms to ensure excellent voice quality under the most demanding broadband conditions. Is Ooma difficult to install or operate? Ooma is easy to setup - most customers are up and dialing in less than 15 minutes. 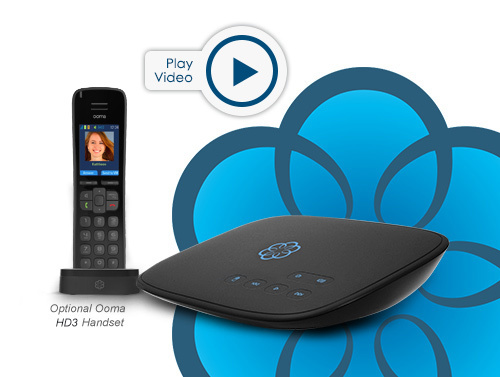 Simply plug your high-speed Internet connection and existing home phones into the Ooma Telo device and you're done! 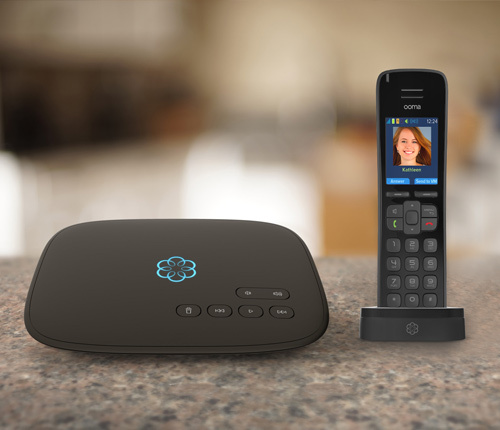 Using the Ooma system is even easier – use your existing home phones like just before. When you register your Ooma device online, you will get to pick a new phone number in any area code in the US (except Alaska)Canada. If you have a phone number you'd like to keep using, in most cases Ooma can transfer your existing phone number for a one-time fee of CDN $39.99. Yes, Ooma provides 911 service.2 We collect your address when you register your Ooma device online, and send it to emergency response personnel when you dial 911. In addition, with the 911 Alerts feature included, you can even setup your Ooma service to notify you via text or email when someone calls 911 from your home phone. Applicable taxes and fees vary by location. Use our tax calculatortax calculator to determine your taxes and fees. No, unlike other products, Ooma does not connect to your computer. This saves you from the hassle of installing software on your computer and from having to leave your computer turned on to make and receive calls. That alone could save you up to CDN $20 per month in energy costs!